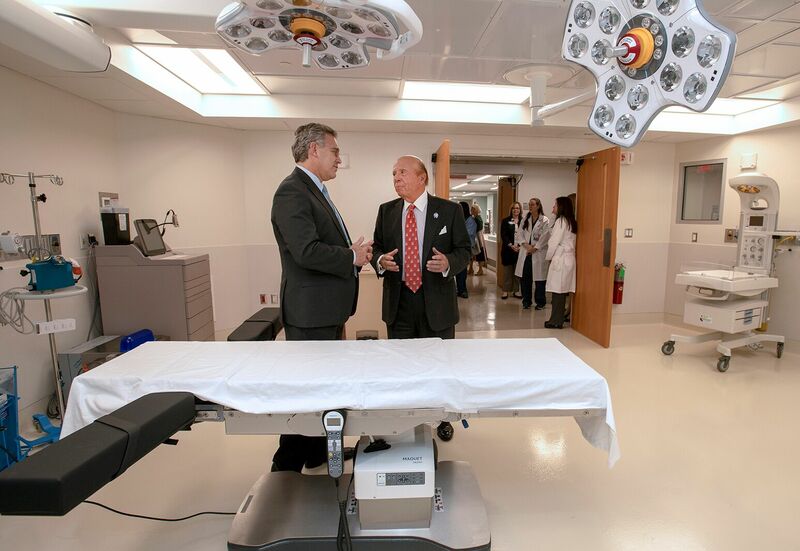 Northwell Health donor Saul Katz, right, tours Katz Women’s Hospital’s new operating room at North Shore University Hospital with Dr. Michael Nimaroff, the health system’s senior vice president and executive director of obstetrics and gynecology. North Shore University Hospital (NSUH) this week opened a new patient recovery area and operating room in the labor and delivery unit of Katz Women’s Hospital. The $8.5 million upgrade to the women’s hospital’s third floor added 5,000 square feet to an eight-bed, post-anesthesia recovery unit and a new labor and delivery operating room containing three infant resuscitation bays, which helps reduce the time to transport newborns to the hospital’s neonatal intensive care unit (NICU). Originally opened in 2011, the three-story Katz Women’s Hospital at NSUH features 73 single-bed rooms, postpartum and high-risk antepartum units for prolonged hospitals stays, a 51-bed NICU and nursery. The hospital delivered more than 6,800 babies in 2018 – collectively, Northwell’s 11 hospitals with maternity units delivered more than 39,200 babies in 2018, representing 17 percent of all babies born in New York State and one percent of births nationally. "Commitment to the care of women and newborns"
The NSUH project is part of a more than $212 million investment that Northwell Health is making in expanding and renovating maternity units at six of the health system’s hospitals on Long Island, in New York City and Westchester County. In the fall of 2018, Huntington Hospital unveiled its $12.5 million Center for Mothers and Babies, which expanded the hospital’s labor and delivery unit to 19 private rooms, a newborn nursery, a nine-bay special care nursery, and dedicated parking and entrance.